Ricardo Montalban, Betta St. John, Rick Jason, Carolyn Jones, Whitfield Conner, Michael Ansara. 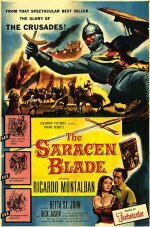 A 13th century revenge drama set during the time of the Crusades in which a commoner exacts justice for the murder of his father by Count Siniscola and his son. Directed by William Castle ("The Tingler") and based on the novel by Frank Yerby.